The largest area excavation ever undertaken in Aberdeen has disclosed astonishing details about the Church of St Nicholas, also known as the Mither Kirk, and its congregation. Alison Cameron, of Cameron Archaeology Ltd, reveals four medieval churches and seven centuries of funerary fashion. In 1874 disaster overtook Aberdeen’s Kirk of St Nicholas. Fire broke out under the steeple, and flames swept through the church. The intensity of the blaze brought down the steeple, which crashed onto the East Kirk with such force that witnesses reported it was completely destroyed. While the East Kirk had only been built 40 years earlier, replacing a 15th-century predecessor, the site it occupied had been at the heart of Christian worship in Aberdeen for over 700 years — longer than Aberdeen itself had existed as a chartered town. Yet thanks to the destruction wrought by the fire, it seemed that the slate had been spectacularly wiped clean. Rebuilt once more, the area of the East Kirk is now being redeveloped by the non-religious OpenSpace Trust to host various community activities, including ballet and exhibitions, as well as providing meeting rooms and a cafÃ©. Archaeology has played a crucial part in this refurbishment, and in 2006 over 80 archaeologists, students and volunteers carried out Aberdeen’s largest ever excavation. Plans to create a new lower storey within the church called for a 20m by 20m area to be dug out to a depth of 3.5m. This quickly revealed that 19th-century accounts of utter destruction during the inferno were exaggerated. Intensely scorched areas of intact stone work still survived. Moreover, the 1837 rebuild had made extensive use of the 15th-century structure in its foundations. This was only the beginning. 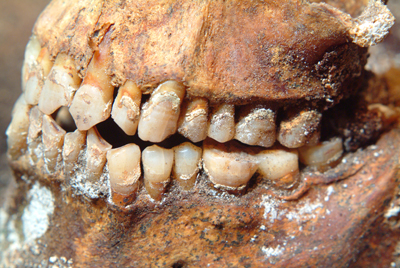 By the end of the excavation four medieval churches, nearly 900 articulated burials and over 3 metric tonnes of disarticulated human bones had been recovered. Amongst this astonishing haul of archaeological data was a portion of a late 11th- or early 12th-century church that can stake a claim to being the earliest standing wall in Aberdeen. As post-excavation analysis is still under way, the following can only give an initial taste of these discoveries. Yet it is already clear that the East Kirk excavations reveal the shifting fortunes of Aberdeen’s worshipping community over seven centuries, and provide a glimpse of the impact of the Reformation. The earliest evidence for activity on the site — in the form of flint scatters and fish- and shell-processing waste — reveals a space originally dedicated to industrial production, rather than religious observances. Whether the earliest features uncovered during the excavations belong with this processing or the earliest church is not yet clear. Both a pebble path following the natural slope of the site downhill to the east and a pair of early ditches could belong to either phase. One intriguing possibility, though, is that these ditches formed the boundaries of the first churchyard. Steve Lancaster (then of Headland Archaeology) examined them, and it is hoped that further analysis will determine their purpose. Only a small portion of the earliest church lay within the excavated area. Partially cut away by later burials, it consisted of a semi-circular apse and mortar floor, which formed the east end of a church that was probably constructed in the late 11th or early 12th century. Comparable examples known from Dunfermline and Coldingham Priory were both erected around 1100, but as the origins of this building type date back to the Roman Empire, it seems likely that earlier examples were constructed in Scotland. One strong candidate was excavated at Hirsel in the Borders, and may belong to the 10th century. A group of 23 infant and child burials were clustered outside the east end of the first church at St Nicholas. While most respected the traditional east—west alignment of Christian graves, a handful deviated from this, resulting in a set of burials that give the curious impression of fanning out from the apse. Very few of the graves intercut each other, probably because they were sunk over a short period of time, and marked. Such markers appear to have varied considerably, with possible examples including large, upstanding stones, post-holes, and even, in two cases, a carpet of mussel shells laid open-side down on top of the grave. Most of the children occupied stone or wooden coffins. The finest stone coffin was also positioned opposite the central point of the apse — arguably the most prominent plot in this part of the cemetery. Is this a sign of wealth and favour at work? Stone-lined cists were also used, with the deceased’s head, or in one instance their feet, cradled on pillow stones. Traces of wooden coffins and their fittings also survived, and one child had been buried in a burnt and hollowed-out log. 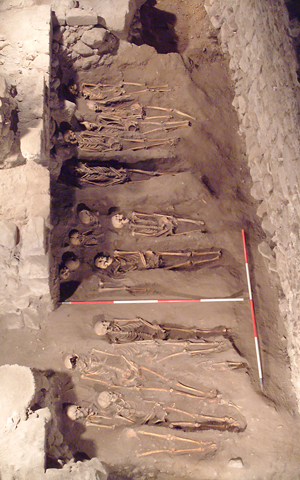 Initial dates from the SUERC radiocarbon laboratory at East Kilbride suggest that the burials took place in the late 11th to early 12th century. Preliminary work on diet has revealed a strong dependency on fish, as befits Aberdeen’s coastal location, with one child being raised on meals that were about 40% seafood. This is an extract. The full article can be found in Issue 258 of Current Archaeology.